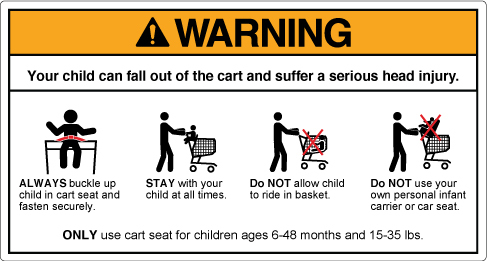 Beginning in January 2012 shopping carts began displaying a new warning label alerting consumers not to use their own personal infant carriers or car seats on shopping carts. This new warning is in direct response to the hundreds of infants who were seriously injured in stores when their carriers fell from shopping carts. In November of 2011 an infant tragically died when his infant carrier fell from the cart in a supermarket parking lot. Personal infant carriers are not designed for use with shopping carts and most manufacturers of the personal carriers have been warning consumers against using their products in conjunction with shopping carts for years. Now the shopping cart industry is communicating this message by placing the warning directly on the shopping cart itself. According to the Consumer Product Safety Commission some 20,000 children are injured in shopping carts each year. 82% of these injuries are falls, making shopping cart falls the nation’s top injury to children under the age of 5. While the majority of these injuries involve small children, mostly in the one to two year old range who fall from the seat or basket portion of the cart, 5% of these injuries involve infants whose carrier falls from the shopping cart. The new warning was developed by the ASTM Shopping Cart Subcommittee and is part of the newly revised shopping cart standard. ASTM International (American Society for Testing & Materials) formed a technical subcommittee with active participation from the Consumer Product Safety Commission to analyze the causes of why children fall out of shopping carts and what can be done to prevent injuries. Developing ASTM safety standards is the process by which children’s injuries involving consumer products are addressed and remedied in the United States. This subcommittee reviewed injury data provided by the National Electronic Injury Surveillance System (NEISS), Injury or Potential Injury Incident Database (IIPI), and special studies done by the Consumer Product Safety Commission. The ASTM standard calls for safety restraints on all shopping carts, keeping carts and restraints in good working order and providing warnings to the consumer. Paul Giampavolo is the leading expert on shopping cart safety. Paul is Chairman of ASTM’s Consumer Products Executive Subcommittee which oversees all Consumer Product standard activities, Subcommittee Chairman of ASTM’s Shopping Cart Subcommittee, recipient of a Consumer Product Safety Commission Chairman’s Commendation in 1996 for Significant Contributions to Product Safety, and President and CEO of Safe-Strap Company. Paul has worked in the retail industry for over 30 years and dedicated his career to child safety.